Yesterday’s FOMC minutes were dovish, with the Fed focusing on its “symmetric inflation objective”. It would be content to let inflation briefly run above their 2% target as the economy continues to recover, and does not force their hand to hike as rapidly as previously perceived. US stocks rallied on the minutes, (S&P finished +8 to 2733), the US 10-year bond yield dipped below 3%, and the DX fell below 94 to 93.95. Gold rallied, and jumped from $1289 to $1295. Overnight, gold continued to probe higher in a range of $1292.80 - $1298.15 and faded some continued weakness in the dollar. The DX slipped to 93.68 against some strength in the yen (110.10 – 109.32), sterling ($1.3350 - $1.3421, stronger UK Retail Sales), and the euro ($1.1690 - $1.1746). Gold was also boosted by a continued softening in the 10-year yield (2.977%, low since 5/14), and mostly weaker global equities. The NIKKEI was off 1.1%, the SCI fell 0.5%, Eurozone shares ranged from -0.1% to +0.4%, and S&P futures were off 0.2%. News from the Commerce Department that it started an investigation into whether automobile imports “threaten to impair the national security of the US” weighed on stocks, as did a continued decline in oil (WTI from $71.70 - $70.86, concerns that OPEC might increase production to make up for shortfalls from Iran and Venezuela). At 8:30 AM, a worse than expect reading on US Jobless Claims (234k vs. exp. 220k) pushed S&P futures to 2725, and sent the 10-year yield to 2.975%. 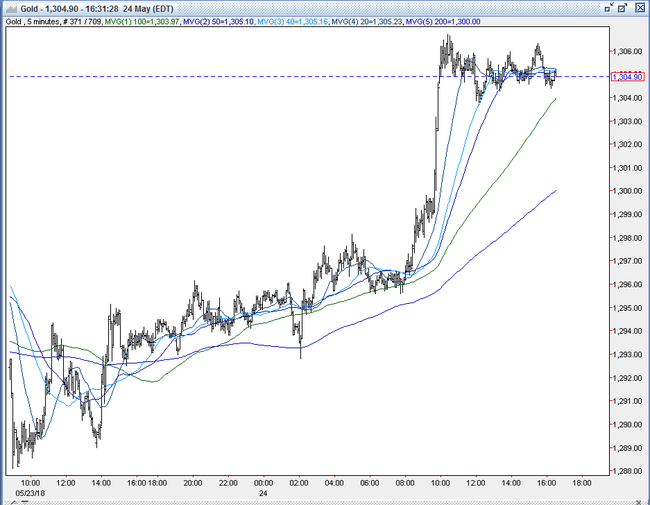 The DX, after a rebound to 93.85, dipped to 93.72. 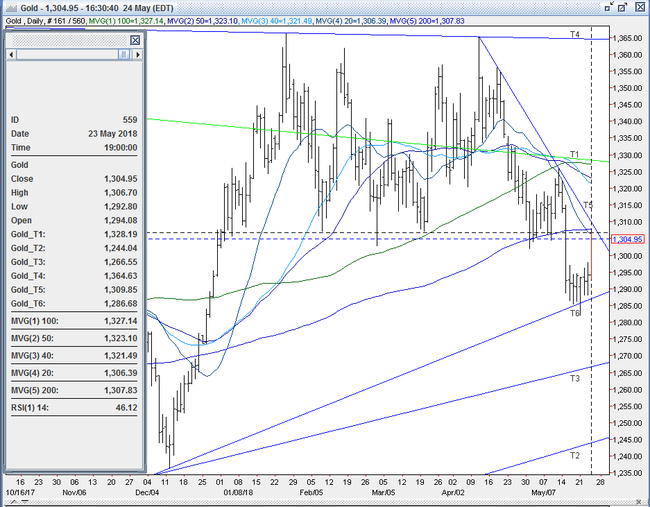 Gold pushed higher, and took out the overnight high at $1298.15, but was capped in front of resistance at $1300. Later in the morning, news that Trump called off the summit with North Korea, citing the North’s “open hostility displayed in your most recent statement” regarding VP Pence. US stocks plunged (S&P -20 to 2712), with energy and financial sectors leading the decline. The 10-year yield fell further to reach 2.955% (2-week low), the DX slipped to 93.61, and gold popped higher. It took out resistance at $1300 and $1301 to reach $1306.50, where resistance in front of the 200-day moving average ($1308) held, with a decent amount of short covering seen. A worse than expected report on Existing Home Sales (5.46M vs. exp. 5.55M) contributed to the price action. In the afternoon, US stocks pared some of their earlier losses (S&P finished -5 to to 2728), helped by some conciliatory remarks by Secretary of State Pompeo, that he hoped Pynogyang and Washington will be able to quickly resume talks, and some slightly dovish commentary from the Fed’s Harker (“I think we’re getting close to neutral”) and saying the Fed could end tightening cycle sometime in 2019. The 10-year yield climbed back to 2.98%, and the DX recovered to 93.80. Gold drifted back to $1304 and was $1304 bid at 4pm with a gain of $11. Open interest was off 6.8k contracts, showing a net of short covering from yesterday’s advance. Volume was much higher with 495k contracts trading, with a fair amount coming from the June-August rollover. Bulls were thrilled with the dovish spin from the FOMC, and were pleased with gold’s strength and ability to breach and hold $1300.. They still feel a relatively and historically smaller Net Fund Long Position along with an elevated number of gross fund shorts leave the gold market set up well to move higher. They will be gunning for probable buy stops over the 200-day moving average at $1308 and then $1310 (down trendline from 4/11 $1365 top), which should leave a vacuum until next resistance at $1315. Bulls then expect the rebound to extend to the $1324-27 area - the 50% retracement of the down move from the $1365 high from 4/11 to today’s $1285 low, and the 100-day moving average. Bears are still comfortable selling into strength, as they expect the recent bounce in the dollar (DX from 88.25 2/16 low to yesterday’s 5-month high at 94.19) to extend. They also look for a resumption higher in US interest rates –especially a rebound in the 10-year yield - and for US stocks to continue to recover. They expect a quick breach back below $1300, and then $1286 (up trendline from 12/15/16 $1123 low) to bring a retest of the recent low at $1281-82 (double bottom, 5/21 and 12/27 lows). All markets will continue to focus on the volatility in the equity and bond markets, geopolitical events, developments with the Trump Administration (especially on US-China trade), corporate earnings, oil prices, and will turn to reports tomorrow on Japan’s CPI, Germany’s IFO, UK’s GDP, US Durable Goods, University of Michigan Sentiment, Baker-Hughes Rig Count, Commitment of Traders Report, and comments from the Fed’s Kaplan, Evans, and Bostic for near-term direction.